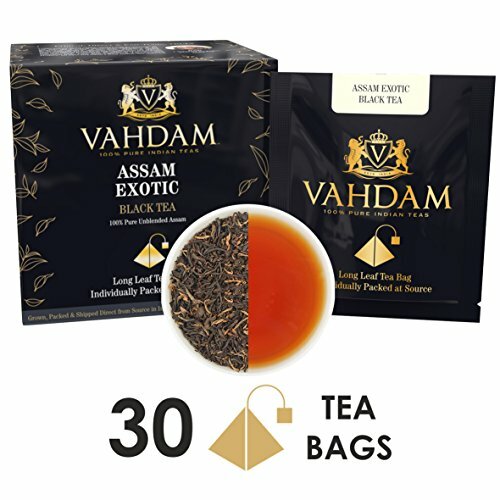 30 ASSAM LONG LEAF TEA BAGS - INDIVIDUALLY ENVELOPED - A rich, robust & malty black tea with golden tipped leaves. A prime season Assam Tea with a sensational aroma of dark chocolates & a hint of malt in every sip. Can be served without or with a dash of milk. Add sweetener as per taste. The black tea bags can be brewed to serve as hot tea or as iced tea. Preparation - 1 Tea Bag | 180ml | 3-5 mins | Brew as Hot Tea, Iced Tea or Kombucha Tea. INTRODUCING THE BETTER TEA BAG - Discover the superiority of a garden fresh LONG LEAF TEA with the convenience of the VAHDAM Single Serve Pyramid Tea Bags. Each serving is packaged in a pyramid shaped nylon tea bag, individually sealed enveloped & sealed at source to ensure you get the freshest cup of tea. Unbox a New Journey in Tea.